Since finishing our work on Helm Crag we've spent much of our time replacing the stock fencing around one of the plantations at Stickle Ghyll. The original fence was put in around 1984 with the help of the Manpower Services (a Government scheme set-up to help people into employment) to help stabilise the scree around the footpath. After we replaced the pitching next to the plantation in 2009 we planted up a few more trees, with the help of the Fix the Fells volunteers, but as time went by it's become easier for sheep to get in and graze on the trees. We therefore decided that the fence should be replaced and all the materials were flown to site earlier on in the year. Long-term it's hoped that once everything is properly established the fence can eventually be removed. The first job was to work out exactly where the fence line should go. With the ground being extremely undulating with lots of large boulders and trees to work around it took a bit of time to decide on the best line. With this done it was time to start digging the hole for the straining post. A hole is dug to a depth the height of a shovel, the post is placed into the hole and rock is compacted tightly around it. This makes sure they are solidly in the ground as the wire fencing is strained off these posts so there's a lot of force on them, and you don't want them moving. With the post in the ground, a single wire is tightened between two "strainers" to give a straight line between the posts. A strut is then added to give the post even more strength, this strut runs parallel to the wire. A section of wood is then chiseled out of the straining post that the strut neatly fits into. The other end is dug into the ground and again tightened using rock. With the post properly secured the next job is to knock in the fence posts at equal intervals along the length of the wire. Once this is done the Rylock stock fencing is stapled to one of the strainers and then strained from the other. Once we were happy with the tension in the fence it is stapled to the other straining post and all the fence posts in between and "hey presto" you've got yourself a nice new section of fencing. Come along for a guided walk with National Trust ranger James and Mountain Guide (and Fix the Fells voluntary lengthsman), Malcolm. There will be chat about Langdale’s history, geology and archaeology along the way and ranger James might even point out a few hidden gems for you to explore if you’re lucky. On the day, meet from 9am for a 10am start. Coffees & teas are available (and pack Lunches available for purchase). Thursday 1st of November: Langdale Pikes (as Tuesday). 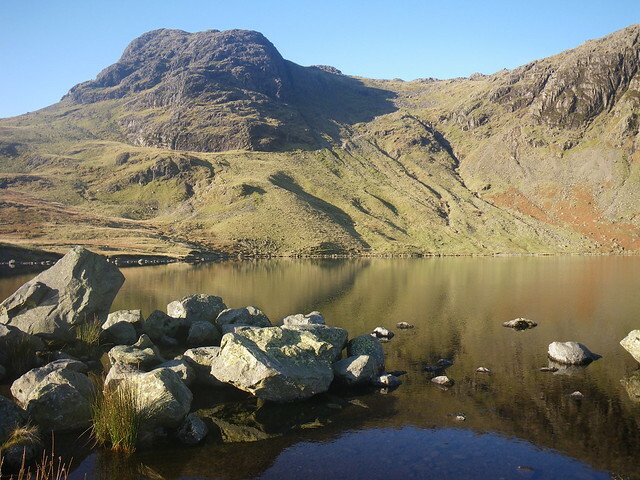 Friday 2nd November: Stickle Tarn and Tarn Crag via Stickle Ghyll (as Monday).